People have asked us, after a little over a week in our new house, if we are “all” moved in. Somewhere underneath there, is our finished basement. boxes in the basement. The plain and simple fact is that we brought too much stuff to our new house, which means plain and simply, that we kept too much stuff at the old house. In fact, our new house looks as if the old house threw up in it. Pack all your jewelry, cash, and family photos (throw away the duplicates). Then get six boxes and pack your favorite objects, clothes, and your baseball card collection (sell the duplicates). Take the rest of your stuff—yes, all of it—pile it on the street corner, and then put a big Free sign on the pile. Depending on the neighborhood from which you’re moving, even the sign will be gone the next morning. With the money that you just saved in moving-expenses, you can replace half of your missing stuff. Don’t worry about the other half. Most of it was useless or redundant, and the rest you forgot you had anyway. You will now be “all” moved in in an hour instead of a year and be free to immediately enjoy your new home. 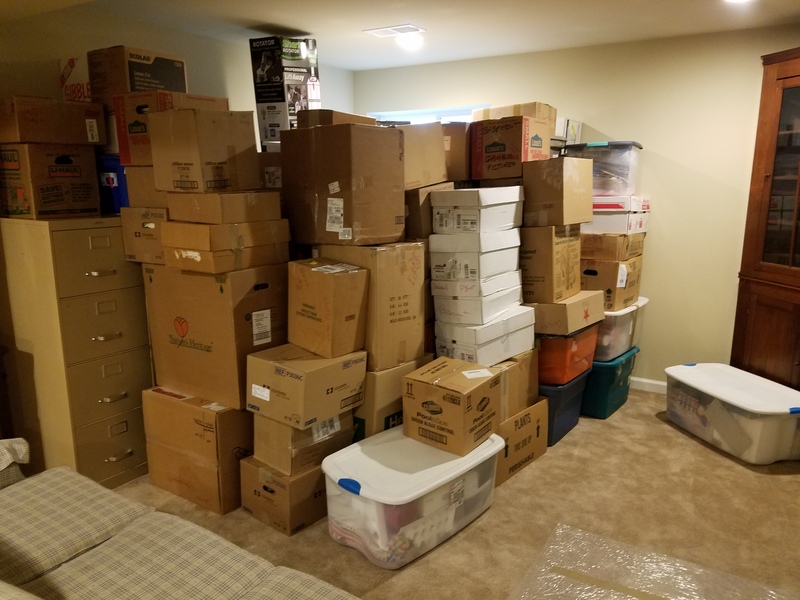 This entry was posted in Life is Interesting, Uncategorized and tagged moving tips, packing for a move, prepaing for a move. Bookmark the permalink. LOVE THIS! 🙂 Great PUBLIC SERVICE ANNOUNCEMENT! I guess we need to continue our conversation in Frederick next week, you know, comparing accumulating “stuff” over the years and wondering what to do with it all. Looking at that picture in the basement made my heart sink, knowing that sometime in the near future it will be our turn. As far as duplicates go, all we have are pictures. As far as everything else, I’m sure the dump will be thrilled with me. Anyway, enjoy the new homestead & looking forward to seeing you on Tuesday. Likewise, Don! Btw, start packing now.